The past couple of days have been rough. I’ve been in curled up in bed with all the goodie pre-symptoms the common cold has to offer: sinus pressure, sneezing and I’ll spare you the phlegmy details. Today will be a short post since I’ve only got a couple of hours to prepare myself for the army of trick-or-treaters screaming for obscene amounts of sugary sweets. It’s my first Halloween in this neighborhood so we’ll see how it goes. In the meantime, I couldn’t pass up celebrating Halloween on my blog either. It seems like everywhere I click there are amazingly ghoulish culinary masterpieces on display. Keeping with the whole Mediterranean theme of my blog, I decided to go with an Italian inspired dish. The pretty pumpkin you see below was one of the many gifts I got while I was at the Beekman and it was perfect for what I had in mind. So without further ado, I present to you my Black Witch Hat Pumpkin Ravioli. The recipe will come soon (depending on my cold and how many kids come pounding at my door). There weren’t as many trick-or-treaters last night as I had expected, which wasn’t necessarily a bad thing. I tended to my cold by drinking plenty warm chai and cozily reading in bed. Now I’m on my way out the door, but wanted to post the recipe for the ravioli before I left. I also want to submit this entry to Jeanne from Cook Sister for this round of Waiter, There’s Something In My… Jeanne is calling for all bloggers to show their gourd love this season. I hope you all had a happy and safe Halloween! Ciao! Cut the pumpkin in half and clean out the cavity of the pumpkin. Cut side down, bake both pumpkin halves until they are tender and you can poke your knife with very little resistance (approx. 45 minutes). 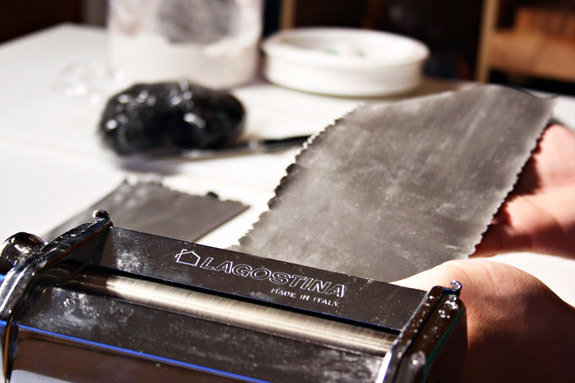 Make the pasta dough by creating a well with the flour and slowly incorporating the eggs and squid ink to form a dough. Knead the dough for 5-7 minutes, cover with plastic wrap and store in the fridge until ready to use. 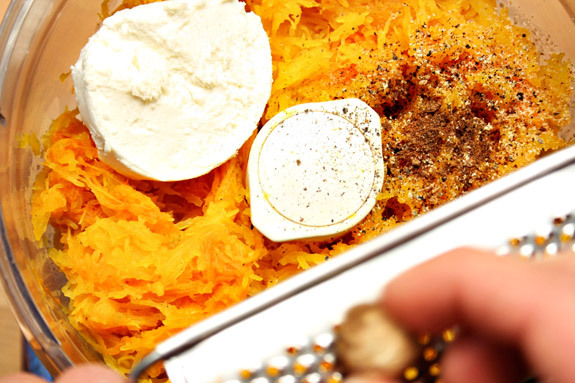 Once the pumpkin has finished cooking, scoop out the flesh and process in the food processor along with the goat cheese and spices. Taste for seasoning and adjust as necessary. In the same sheet tray, spread pumpkin mixture and return to the oven for another 15-20 minutes so that the excess liquid in the pumpkin puree is allowed to evaporate. Refrigerate the mixture until cooled and ready to use. Brush a little egg wash around the edges of the filling and cover with another sheet of pasta. 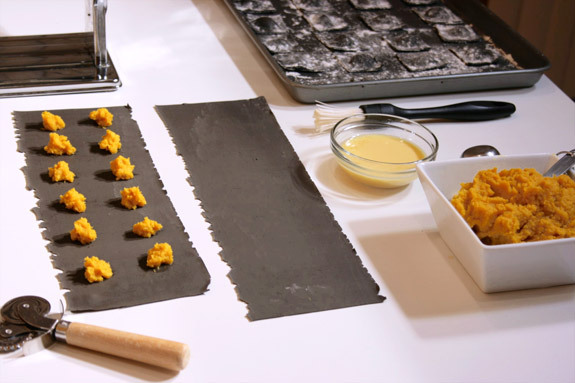 Seal the ravioli sheets carefully, making sure no air bubbles get trapped inside. Boil the ravioli for 5-6 minutes, or until pasta is al dente. For the sauce, melt the butter and sage in a small saute pan. Brown the butter carefully, making sure it does not burn. Toss the ravioli in the sauce and enjoy! note: If you can’t find squid ink or don’t particularly care for it, you can substitute it for black food coloring. If you don’t want or don’t have time to make your own ravioli, store bough butternut squash ravioli work great with this sauce and are perfect for any autumn dinner. Posted in Italian, recipe, savory by Antonio Tahhan on October 31st, 2008. You can follow any responses to this entry through the RSS 2.0 feed. You can leave a response, or trackback from your own site. I’ve never seen black ravioli! Brilliant for Halloween. These look FAB. Looking forward to the recipe when you’re feeling better. Perhaps you need a little witch’s brew. Holey smokes!! Those are gorgeous! Where do you find squid ink?? 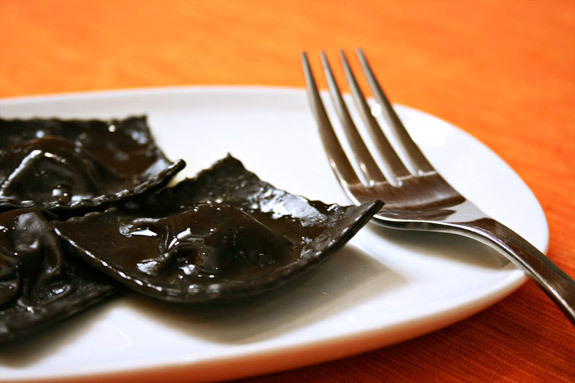 Can I tell you how much I loved these witch hat ravioli? These are too, too inspired! I wish that someone made a treat like this one for me at Halloween. This is so beautiful. Hope you feel better. Hope you are feeling better! That ravioli looks so striking…aside from delicious 🙂 So perfect for the season! Love the ravioli! Sure hope your feeling better by now! Tony, this is freakin’ awesome…Halloween colours with food that pairs well. A simple brown butter safe sauce here? I have subscribed to your RSS and absolutely adore yr blog. Love the pickies and the ingredient explanations in them. PLease keep up the good work. Where do u get black squid ink? 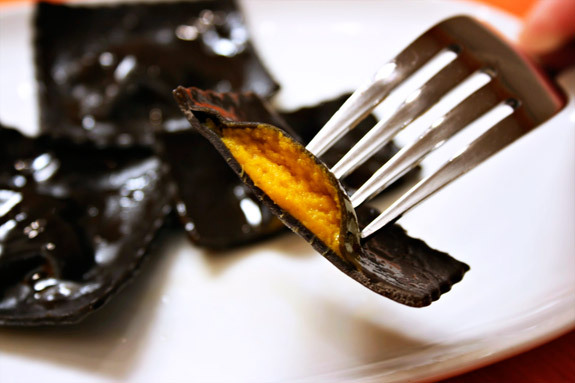 I can’t imagine a more perfect dish for Halloween- These ravioli are absolutely stunning! what a perfect halloween dish! i’m jealous… those ravoli are beautiful. These are easily the coolest Halloween treat I’ve seen posted around the web. Three cheers for creativity! Hey, I’ve passed on an award to you – if you’re into that thing. Check out my post on Chai Cookies for details. A beautiful treat, Tony! Nice and ghoulish for Halloween, to be sure, but presented differently, it could be striking and elegant for a grown-up autumn dinner party. Just found your site thanks to Scraping the Skillet. I will be back. This is phenomenal! I love the idea! I’m not sure where to get squid ink near me but I’ll definitely have to keep this in mind for next Halloween! Thanks for all the wonderful comments everyone! I’m feeling a lot better now and will hopefully get back to blogging soon. As for the squid ink… I got mine while I was in Venice last winter, but I’m sure there are many online stores that sell them as well. A google search for squid ink led me to a few online stores that you should check out if you’re interested. Make sure to use the ink sparingly because it can acquire a really fishy stench if you add too much of it (I speak from experience). If you want to avoid all that, you’re better off using regular black food coloring from the store. Welcome Zlamushka! Thanks for stopping by! Nick, black food coloring would work great here. No need for the squid ink, it’s just something I had laying around from a previous trip in Italy. Welcome Terry! These would be great for a grown-up dinner party. I love, love, love this! Squid ink is so much fun to play around with. 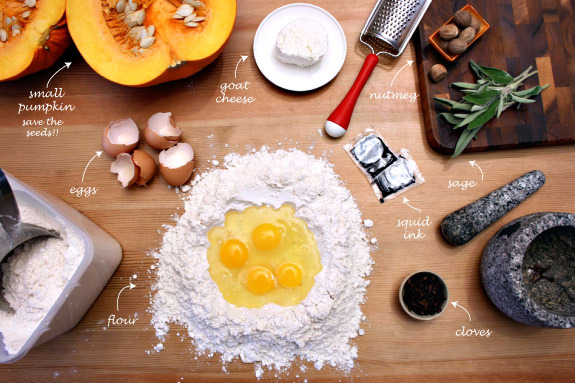 I’m particularly fond of squash and goat cheese with pasta but usually toss them with penne or spaghettini. Your ravioli look beautiful!! I have heard of squid ink pasta but never tried it. I see that you caution against using too much because of the fishy smell. Does the pasta also end up having a fishy taste? A spookily special pasta for Hallowe’en!! Gorgeous photos too!! Those are absolutely fantastic. I am saving this recipe for next year. what an amazing recipe. really beautiful. i can’t think of a better way for one of our pumpkins to die. You really did the Beekman pumpkins proud with that one!! i’m in love with you right now. in a really girl foolish way. do you know this is my absolute favorite pasta dish!?!?! What a neat idea, and delicious! I love squid ink and I love pumpkin! This is genius! I love your photos!! These are really cute! I can’t wait to see what my daughter thinks of them at Halloween when I tell her they are witch hat ravioli.. They definitely play and fit the part. Yumm.